The Moon is full in the 15th degree of Virgo at 6:07 pm GMT on 5th, as Venus crosses the degree of the Lunar Eclipse which occurred on 8th October 2014. Together, Venus and this Virgo Moon illuminate the past even as they shine their light upon our future. This is a gentle and yet formidable alliance. In her dance with Uranus Venus encourages us to relinquish our own plans in favour of the sacred design which reveals itself through our life in the very living of it. This is not a state of giving up, battle worn and weary, but one of profound grace. In this act of surrender we acknowledge that we simply cannot know the ins and outs of our becoming, only distinct parts – an insight here, a knowing there. As such, faith in a deeper force within which guides us no matter what we may or may not ‘know’ becomes a pre-requisite for the path ahead. This is true freedom, for we are no longer invested in manifesting our version of the world but that of the divine which flows throughout the universe shaping as it goes. Sometimes the truth is obscured by the power of our own desire. We yearn for an envisioned outcome and resist indications that we may be barking up the wrong tree. When we project a specific scenario into our future – be it a relationship, a job, a state of mind or way of being – any challenge to its potential manifestation can feel like an attack on our very existence. Somewhere inside a voice tells us ‘I can never be happy if my future doesn’t take this specific shape!’. Today the heavens tell us this voice lacks imagination and we need to get more creative! What we hope for may or may not be where we are headed and we need to stay alert to the signs which keep us on the right track. Which is precisely why now is a good time to let it all go and see what happens. Allow the energy of striving and desire to settle for a while. Look around and see where we are in relation to our hopes and aspirations, be they a millionaire lifestyle or simply a peaceful life! Take stock honestly: are we realistic in our notions or trying to jump the gun? Do we expect outcomes for time and effort we’re not prepared to put in or results that we’re doing nothing in the present to create? Are we simply waiting and hoping for things to change while we continue on the same old track? Can we really see ourselves living the future we desire or does it feel like a disembodied fantasy with no connecting path from here to there? As we remove emotional hooks from our future imaginings we can begin to discern which are born of truth and which of fantasy that distracts us from the birth of the authentic self. 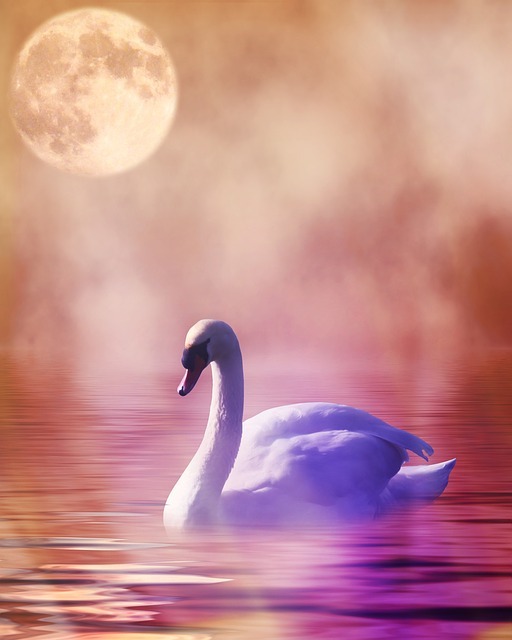 As I look at the chart for this Moon I remember a swan I had the pleasure of meeting a few weeks ago. Her serenity and poise as she glided towards me was breathtaking. The spotless white of her feathers, her perfect form all spoke of sacred purity. The moments I spent with her as she rested by the waters edge felt timeless. But the most sacred aspect of her demeanour revealed itself when a large dog ran towards her. Instead of swimming off to escape its boisterous approach, she simply lifted herself up out of the water, flapped her huge wings and hissed. Her imposing canine visitor soon got the message and wandered off in the opposite direction trying not to look like he’d been put in his place by a ‘mere’ bird. As he left she lowered herself back into the water, folded her wings and looked me in the eye knowingly. This is how the divine lives through us: gently, quietly, guiding us through the waters of life untouched by the changing currents as they ebb and flow, knowing its direction. And then, when necessary, it is fierce in its approach, uncompromising. If we get too boisterous in our own notions of what WE think should be going on we may hear a sacred hiss warning us off the path we have chosen. It may come as a feeling that something really isn’t right no matter how much we want it to fit, or in the form of repeated obstacles on our chosen path. The sacred may act through someone else who hisses at our approach. If we choose to ignore the ever present warnings we may find our face slapped by a large and powerful, but nonetheless beautiful, wing. The messages are there all the time, forever guiding us, but we must choose to listen, to honour and respect the wisdom of the sacred over and above the noise of our own desire. A willingness to let go at this Full Moon, allowing all that matters to fall away, invites that which is aligned with our true path to return, as the saying goes, forever. We simply cannot lose that which is a part of our journey, a part of our very spirit. But we may not recognise it to be so without the courage to accept that it may be a red herring: that we may have to release a dream to find our truth. As this month progresses, we can discern truth from fantasy, possible future from wistful imaginings. The process begins now as we allow all that we desire to depart from us, knowing that those things which are ours will forever remain.